Regardless of whether one counts the day’s beginning at midnight, or as sometime in the early hours of the previous morning, it’s been a long day and that principally for one reason. At around 0222 this morning, my partner and I welcomed into the world our beautiful son and Sinéad’s brother, Samuel Jamieson. Samuel, this seven pound two ounce wonder, represents, no less than other children, what Jürgen Moltmann once named ‘metaphors of God’s hope for us’, that with every child, a new life – original, unique, incomparable – begins. And that while we typically ask, who does this or that child look like (apparently because we seem to think we can only understand the new in the comparison with what is already known or similar), we also encounter the entirely different, the entirely dissimilar and unique in each child. It is, Moltmann suggests, precisely these differences that we need to respect if we want to love life and allow an open future. Moltmann also recalls that with every beginning of a new life, the hope for the reign of peace and justice is given a new chance. It is important – and I feel the weight of the challenge here – to see Samuel in his own transcendent perspective and so to resist forming him according to the stale images of our world. Every new life is also a new beginning of hope for a homeland in this world which is-and-is-being redeemed. If it were not, we would have no reason to expect anything new from a beginning. 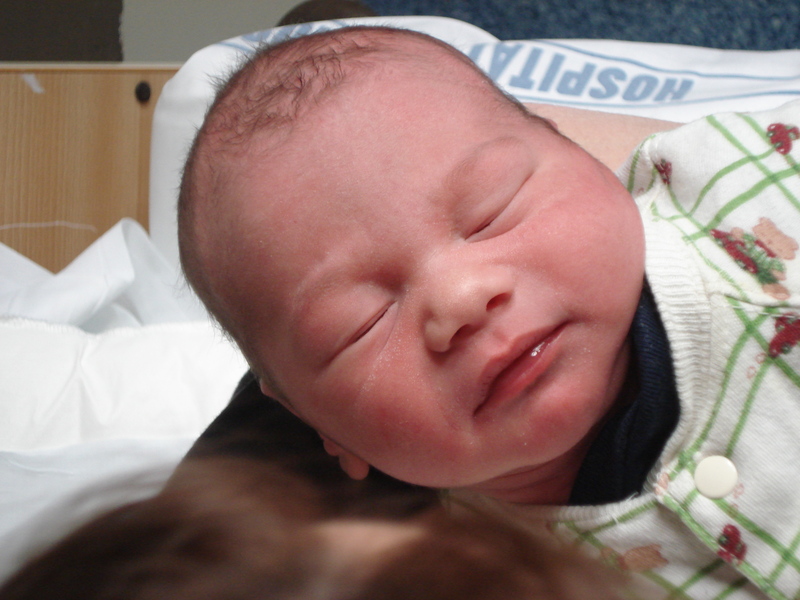 Samuel will be baptised on 14 November at Highgate Presbyterian Church in Dunedin. A final thing: Mother and Samuel are both doing very well. Dad and sister are glowing. Even the dog seems unusually excited. It is yet to be seen if our adorable chickens start laying eggs again, inspired by the events of recent days. Congratulations to you Jason and your wife. Samuel arrived soon after my own birthday. May God grant a long and healthy life and may he be to the Kingdom of God what Samuel of old was to his God. I Samuel 2:1-10 – but watch out for v. 11! A thousand blessings! Congratulations, Jason. May God bless you all – including the chickens! Wow, congratulations! I became a father almost precisely two months ago and am still searching for words/concepts to describe what that means. Moltmann’s “‘metaphors of God’s hope for us’” sounds promising … but I have to confess that I still can’t really theologically process the inner tension I feel between a surprising love that has welled up from an unknown source and the certitude that this gorgeous thing will inevitably suffer. I’m choosing Ps 23 for her Christening. I recently discovered that Moltmann preached on Ps 24 (the subject of my thesis), so that may provide an interesting perspective on both the Psalm and the situation and help me understand your quote. Congratulations sir! Blessings on this new addition to the family — and kudos on giving him the best name in the Bible. Congrats, Jason! He’s a cutey! Beautiful Jason. This has made my week! Wow – that is fantastic news Jason – blessings to the whole family. And Samuel was early right? Nothing like turning up early in life – the polite thing to do really. Congratulations! yeah, great news Jason. Congratulations. He looks so peaceful… lets hope it stays that way for a while yet. Praise God for little strangers and new opportunities for hospitality! Jason, many congratulations to you all. Congratulations to the two of you, and Sinéad well done on being the big sister of a little brother. Hope all goes well for the four of you. Many thanks folks. Samuel Jamieson is doing well, and the rest of us are learning … again. With our five children the curious thing that I’ve always found is that people recognise them as being my wife’s children, because these people claim that they all look like her. Yet I’ve never seen that resemblance at all….